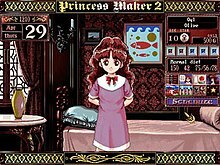 Princess Maker 2 is the second installment in the Princess Maker series of life simulation games developed by the Japanese company Gainax. It has been translated into English, Korean, and Chinese. In this fantasy game, the player takes role of a war hero who raises a girl to the age of 18. At the end of the game, the daughter goes into a line of work; what this work is, how much talent she has for it, her marital life, and her overall happiness all depend on the player's actions. The game takes place in a fantasy world roughly modelled after medieval Europe. The starting year is given as 1210 K.D. The player's character is a famous warrior who defended the kingdom from an invasion by Lucifon, the Prince of Darkness (a corruption of Lucifer); consequently, he is known throughout the land as a military hero and receives an annual salary from the palace. One night, he receives a communication from a god whose identity is determined by the birthdate the player selects at the beginning of the game. This god bestows upon the mentioned player a child of the heavens, and it is their duty to raise her from the age of 10 to the age of 18, at which point she will enter a line of work; the most desirable outcome is that of a royal princess. The daughter has a set of statistics that fluctuate depending on the activities the player assigns to her schedule, including various part-time jobs, schooling, adventure, and free time. It is these statistics that ultimately determine her final occupation, her skill level in her line of work, and her overall happiness in life; her marital fate is also decided, in part, by these statistics. The game also makes use of some invisible statistics to determine the occurrence of certain special events. The god who visits the father is the daughter's patron god. That patron determines her starting statistics in a way that is loosely related to the god's role in the Roman pantheon; for example, a girl born under Mars begins the game with an advantage in fighting reputation. The game features 74 possible endings. Next Generation reviewed the PC version of the game, rating it three stars out of five, and stated that "This is the strangest game to hit the U.S. PC market in years, and on a certain level, Ignite should be commended for taking the chance to release it. Whether it can, or maybe even should, find an audience is another matter." The SNES version of the game, which features a new cast of characters. The daughter does not have a default name, but is named Melody Blue in o Go! Go! Princess, and the player's butler's name is Raphael. The combat and adventure systems are redesigned. In combat, the daughter's actions are now determined by cards that are played during battle, along with the stats built up through schooling and jobs. Along with the original Princess Maker 1, Princess Maker 2 has received a newer "refined" remake for Windows. The overall graphics and sound quality of the game have been improved, along with various other elements. An English-language version of Princess Maker 2 Refine was released via Steam in Fall 2016. ^ a b "Princess Maker 2". IGN. Retrieved 1 July 2012. ^ "Finals". Next Generation. No. 32. Imagine Media. August 1997. p. 119, 124.